I first met with Ron Goetzel doing research for my book The Healthy Workplace, and soon after meeting him realized that I had landed on a gold mine. Ron is a Senior Scientist and Director of the Institute for Health and Productivity Studies at the Johns Hopkins University Bloomberg School of Public Health and Vice President of Consulting and Applied Research for Truven Health Analytics. Ron is the author or co-author of many influential studies that measure the ROI of health and wellness programs. He has interviewed and written about countless companies that have successfully rolled out wellness programs, and he is an authoritative source when it comes to measuring their benefit. I’ve included some of his current research in my book, but he’s always got more research underway. He’s worth following! LS: Ron, we have talked before about some of the work that you have done in terms of looking at the ROI of health and wellness programs. Where can people go to find some of your studies and the companies you’ve interviewed? RG: The Health Project is the repository of the companies, about 60, that have won the C. Everett Koop National Health Award, and have been able to document that their programs improve health and save money. This year O’Neal industries, a building materials manufacturer in Alabama, won the award along with McKesson Corporation, a health care software company. Other companies that have won include USAA, Dell, J&J, Prudential, Dow Chemical, the list goes on. If you go to the website, you can find each organization’s individual application for the award – how they presented their program, and all the data that show they did, in fact improve health and save money. These are concrete case studies. The other place you can go is to Promoting Healthy Workplaces on the Johns Hopkins website that takes some of these Koop Award winners like J&J, LL Bean, Citibank, and a few others, and looks at these companies through a qualitative lens. We spent a day with each organization to figure out their “secret sauce” — what they do and how they do it, so that we can understand exactly how their program works. We put our findings into journalistic format, rather than a strict scientific research study format. LS: Did you find, when you did your research on health and wellness programs, that there were consistent ways that organizations set up their program (internally) that made them successful? Did this vary based on size of company or industry? RG: The answer is that each organization needs a champion, and that champion needs to be an important person in a position of making a difference that can leverage resources (like time and attention) within the organization. There is a small company called Next Jump in NYC and a company called Turck in Minneapolis, where the CEO is the champion. In other cases, it’s the Medical Director who is passionate about health promotion, who works with the other senior level people in the company. Sometimes you have champions who come out of nowhere, but they have a huge amount of influence in the organization. The common theme here is that unless you have senior level support, it’s not going to work. For example, you may have someone in the fitness center who thinks it’s a good idea to be healthy, but everybody else is working on projects and deadlines and making revenue, so nothing is going to happen. You need senior level support and that level needs to influence middle managers/supervisors. In a large company like J&J with 120,000 employees around the world, the fact that the CEO says this is something important is not enough to change behavior. You also need to have the company presidents, senior executives in HR, and people managers to send this message to supervisors. Health then becomes part of personal accountability and employee evaluations. The message must be consistent across tiers of leadership that heath is critical for the company’s success, otherwise it will not get a foothold. On the grassroots side, unless the employees want to adopt these healthy programs, they will not work. A senior manager may be a fitness nut, but if no one in the company is interested trying something new, it won’t work. You’ve got to create a culture of health for the line worker, the person working at the machine, or at the front desk. Each person needs to believe that health is important for his or her personal improvement and it aligns with what the company is all about. LS: Did you find that any of these organizations you met with had to change their culture to be healthier, and how did they do that? RG: Most of these organizations I met with were almost “born” caring about health, but they are continually aligning their health program in a direction that supports best practices. Sometimes people are brought in – a new medical director, for example – to change culture. They are almost like the Donald Trump of wellness (in a nice way). They are there to push an agenda and make it happen. Most of the organizations already have a good foundation of health – they are good organization, they care about people – but this person lights the fire under them. Sometimes these “disrupters” are charged with creating a business case, build relationships with the right people and establishing a support/advocacy group. When they go in front of the executive committee and say, “I want to invest $15 million dollars in this,” they won’t be booed out of the room. LS: Yeah, I can see some parallels between that need for a “disrupter” and a business case for health, and the need for a business case to create a new workplace strategy. For example, in when we are designing a new space for companies, we often get a lot of resistance from employees. Even if the workplace is better than what people might have occupied before, it’s still different. People viscerally react to that (negatively) and change management has been a big part of our practice for a while now. When it comes to changing healthy behaviors, I would think that we’re getting into even stickier territory. It’s one thing to ask someone to move his or her desk; it’s another thing to criticize someone’s lifestyle behaviors. “You should stop eating fried food, that’s bad!” I can see health and wellness getting into our personal space even more. It must be an even harder job to create change in this case. RG: First, you don’t want to “tell” people to change their behavior or blame them for a health condition. That’s wrong on so many levels. You do have to establish the right culture that accepts disrupters. If your organization is one where people just sit at their desk all day for 12 hours, no one is going to encourage workers to be more physically active or go to the gym during the day. LS: Do you find companies are focused on the right outcomes when it comes to health? Does it vary based on company, culture, what they do, etc.? RG: Measuring health and wellness is actually a pretty specialized skill, and most people don’t know how to approach it or what it means. When I am asked to evaluate a program, often I am inundated with data that don’t mean anything – people are just throwing data at you. In general, companies do a really lousy job measuring health promotion program impacts. It’s not that they don’t want to measure better, but it’s not always easy. A lot depends on what they want to get out of the initiative. For example, if I go to a senior executive and say, “You have a wellness program, what’s important to you?” The executive might say, I want employees to be aware of their health, to know there are programs available to them, or the rate of participation and engagement in these programs. This is pretty easy to measure, because all you have to do is administer a survey and ask those questions. But when executives want to know how the program impacts worker performance, and you ask them, “How you measure performance today,” often their answer is that they don’t measure performance. So if that is the case, measuring program impact becomes difficult! In terms of reducing health care costs, most of the ROI studies are well designed, but complicated to do. You can’t just on a whim say, I used to pay $10,000 per year and now I pay $9,000 a year. This might be because you reduced benefits for employees, so now they are paying more out of their pockets for healthcare. Things like absenteeism, disability and workers’ compensation are also difficult to measure. And then you get into things like how these health programs help attract talent or increase the value of the company’s stock market. Interestingly, we’re going to be publishing a paper in January that shows that companies that won the C. Everett Koop Award outperform the S&P 500 in the stock market, and have done so for the last 15 years. Dr. Ray Fabius is also an author in this study (which compared the performance of companies that won the Corporate Health Achievement Award (CHAA) with the S&P 500). LS: What is the difference between the CHAA and the Koop award and why would you choose different award winners to compare to S&P 500? RG: The Koop award is focused on health promotion and disease prevention programs, while the CHAA is more occupational health and safety oriented. When you apply for the CHAA award, there is a cost because ACOEM sends a team of people to inspect your worksite. For the Koop award, there is no cost to apply, but you do need to provide statistically significant data to prove to 10-15 reviewers that your program has the hard data to show that heath has improved and dollars were saved. Some companies have pursued and won both awards. LS: Some companies claim that they are too small to afford to compete for these awards. Have you found smaller organizations apply for these? RG: Well, there are some awards that are targeted at small companies. The Wellness Council of America (WELCOA) has an award based on surveys and self-reports and the National Business Group on Health also has a self-report application format. But even for the Koop award, we’ve had some small organizations submit applications and win. If their insurance costs have remained flat, or if they have good safety records, that is evidence of health improvements. They just need good data to prove it. LS: It has been bugging me that none of these awards and measures talk to each other. See previous post on health metrics. It seems like the building design, products and workplace programs are all evaluated in a vacuum. Is there a movement out there to connect some of these things? RG: That’s true for every industry out there and even within organizations. My group is trying to connect health measures in a number of ways. We’ll be looking at physical space and how can influence health as part of a large project for the CDC focused on updating the CDC Worksite Health ScoreCard. 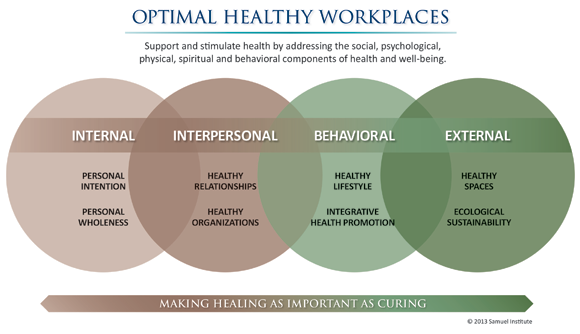 The Samueli Institute in Alexandria, Virginia looks at optimal healthy environments (OHE) as one of the many aspects important for health. Delos is also getting their name out there as a wellness organization as it relates to the environment. LS: Yes, I’ve noticed there are small pockets where there is cross talk across industries and disciplines, like at Harvard’s SHINE center, UC Berkeley’s Interdisciplinary Center for Healthy Workplaces and a few other places. But it seems like we are missing the big picture by not measuring some of these health measures more holistically. Something to aim for! To wrap, I have to ask…Where do you think all this is going? What can we expect over the next five years – what will happen in the world of wellness? Great interview, Leigh. I really like this series. Congrats on keeping up the momentum. I particularly think that connecting the dots between workplace, personal health, schedules, workload, vacations, maternity and paternity leave, etc. is really the future track. In America particularly we have no understanding of work life balance unlike Europeans who seem to better get it. You know IBM in the '70/'80s were totally dry in all countries but France where the cafeteria would provide wine at lunch! I wonder if that improved productivity. Perhaps also by connecting the dots to other healthy issues might create enough interest and support to figure out how to measure productivity.